Este artículo está disponible en español aquí A major new international study has recognised the crucial role Arctic Indigenous Peoples have to play in ecological restoration efforts that help build resilience to major climate-change driven shifts in the distribution of land, marine and freshwater species. Published in the prestigious journal, Science, the new study highlights the extent of climate change-driven changes in the distribution of species. It identifies the emerging challenges these shifts pose for indigenous and non-indigenous communities and economies from the tropics to the poles. “Previous studies have shown that land-based species are moving polewards by an average of 17 km per decade, and marine species by 72 km per decade. Our study demonstrates how these changes are affecting worldwide ecosystems and human health and culture in the process,” says Associate Professor Gretta Pecl, lead author of the report, from IMAS and the Centre for Marine Socioecology, Tasmania. “While some species favour a warmer climate and are becoming more abundant, many others that humans exploit or interact with face depletion or extinction. Human survival depends on other life on earth so the redistribution of the planet’s living organisms is a substantial challenge for people worldwide,” says Pecl. The depletion and extinction of species as a result of climate change forms part of a wider pattern. Scientists are broadly in agreement that Earth is currently undergoing a sixth mass extinction event that would take life ten to thirty million years to recover from. Due to human-induced environmental impacts, globally, species are going extinct at 1-10,000 times the ecologically normal ‘back ground rate’. These drastic losses in biodiversity are reducing the resilience of ecosystems and their ability to cope with ecological shocks, like increasingly frequent extreme weather events caused by climate change. Livelihoods, employment and profitability in industries such as marine tourism and coffee growing are being jeopardized as primary growing zones shift, corals die, jellyfish infest waters used for recreation, and urchins destroy fish habitats in kelp forests. Climate change-related species shifts will also have profound consequences for human health. Rising temperatures are encouraging the poleward spread of mosquitos capable of carrying malaria, placing new regions at greater risk of this and other illnesses. Changes in the distribution of species are also directly impacting the food security and traditional knowledge systems of Indigenous Peoples who rely on subsistence herding, hunting and fishing activities for their physical, cultural and spiritual well-being. The Arctic is an area of particular concern in the study. With Arctic temperatures recently at 20°C above average and sea ice at its lowest recorded extent, in 2016 authors of the comprehensive Arctic Resilience Report warned that rapid melting of Arctic ice could trigger polar ‘tipping points’ with catastrophic consequences worldwide. Indigenous Peoples who still retain close, subsistence relationships with Arctic ecosystems have been the first to notice the biological ‘indicators’ and ‘subtle signs’ of these drastic climate impacts. The authors of the Science study have documented these observations in collaboration with Arctic Indigenous Peoples, making them visible through the study. One such example comes from the Näätämö River, one of Europe’s last free-flowing rivers to host wild populations of Atlantic salmon. Located in Finland’s far Arctic North, for thousands of years, Näätämö and her salmon have been at the heart of the Skolt Sami People’s subsistence and culture. This relationship has endured despite the forcible relocations suffered by the Skolt Saami during the 20th Century. Climate change is endangering Näätämö’s salmon populations and the Skolt way of life, while mining, aquaculture and tourism are potential future drivers of change. Increased temperatures and rainfall variability are causing the salmon’s aquatic habitat to become less optimal for the fish, with drought endangering salmon spawning. If water levels become too low, salmon migrating to upriver spawning sites from the Atlantic will not be capable of swimming in the river. Such stressors are what can cause a species to shift their range in search of more favourable conditions. Another case study comes from Kolyma in Russian Siberia where the Chukchi People’s physical, cultural and spiritual well-being relies primarily on reindeer herding. 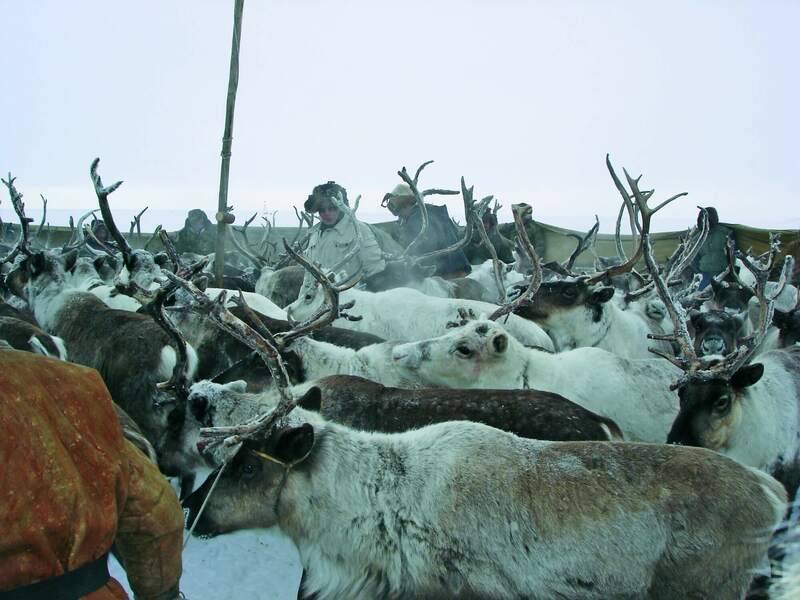 Climate change is causing irregular freeze-thaw events that lock-up the reindeer’s principal winter food, lichen, beneath a layer of ice, as well as the melting of permafrost and other impacts that are causing changes in reindeer migration patterns. Maintaining the transhumance way of life that the Chukchi People have traditionally operated is becoming more and more challenging. However, as well as being a region of global concern, in a Science first, the study highlights the work of indigenous Arctic communities as major inspirations in the global effort to curb and build resilience to climate change. In climate circles, resilience is defined as the capacity of interrelated human and natural systems to “buffer and adapt to stress and shocks, and thus navigate and even shape change”. 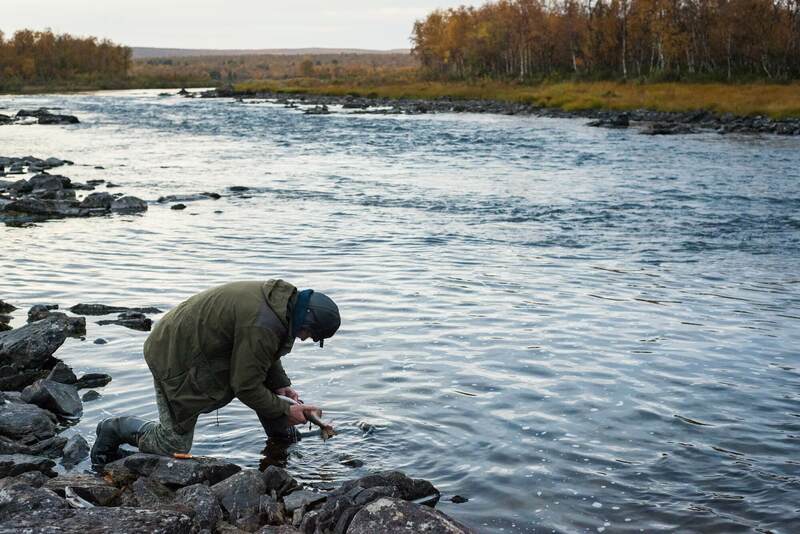 The Skolt Sami are using their traditional knowledge and working hand-in-hand with scientists to guide efforts to restore the Näätämö River, building back the water system’s resilience and in turn their own. As part of the pioneering Näätämö River Co-Management Initiative, the Skolts have developed locally devised indicators of environmental change that are more sensitive than Finland’s nationally mandated regulatory parameters. Based on traditional knowledge transmitted and updated down the generations, these indicators systems are helping the Skolts and partner scientists to detect and address ecological changes in a pre-emptive fashion. The Skolt Saami have already identified and begun to restore key salmon spawning sites, helping the embattled fish to reproduce. They have also begun to adapt their own fishing practices and encourage other local subsistence fishers to do the same. Changes include using one net during the salmon season, rather than three and shifting fishing practices to focus on other species that inhabit the river, including fish that prey on young salmon. The innovative co-management structure of the project is giving the Skolt Saami a louder voice in matters concerning the Näätämö River, opening spaces for them to share observations and recommendations based on traditional knowledge. ‘Co-managers’ in the process include scientists and local authorities, brought together in a structure first pioneered in North Karelia, Finland. Showcasing the efforts of the Skolt Saami and other indigenous peoples like the Chukchi, the new Science article is an important recognition of the vital role indigenous knowledge and its holders have to play in leading efforts to respond to climate change. “Most of the things we hear and learn are narratives of how serious the northern climate change is getting”, says Pauliina Feodoroff, President of the Saa’mi Nue’tt cultural organization. Dr. Tero Mustonen, co-author of the new Science study and Director of the Snowchange Cooperative, an Arctic-wide network of indigenous and traditional peoples, says the new study is a call to action for more Indigenous knowledge-led ecosystem restoration. “For many Indigenous communities, the climate change of today results from the past decades, even centuries of industrial uses of lands in their homelands that has caused environmentally negative consequences. Present resilience can be built, as has been demonstrated by the Skolt Sámi in Finland, through locally led efforts of ecological restoration in those areas where it makes sense. Indigenous knowledge has also proven to be a viable method of detecting change, such as arrival of new species to northern locations”, says Mustonen. In light of the new study’s findings, Mustonen is calling for a moratorium on destructive and extractive development activities in Arctic environments and territories, where the preservation of carbon sinks can help slow the impacts of climate change. 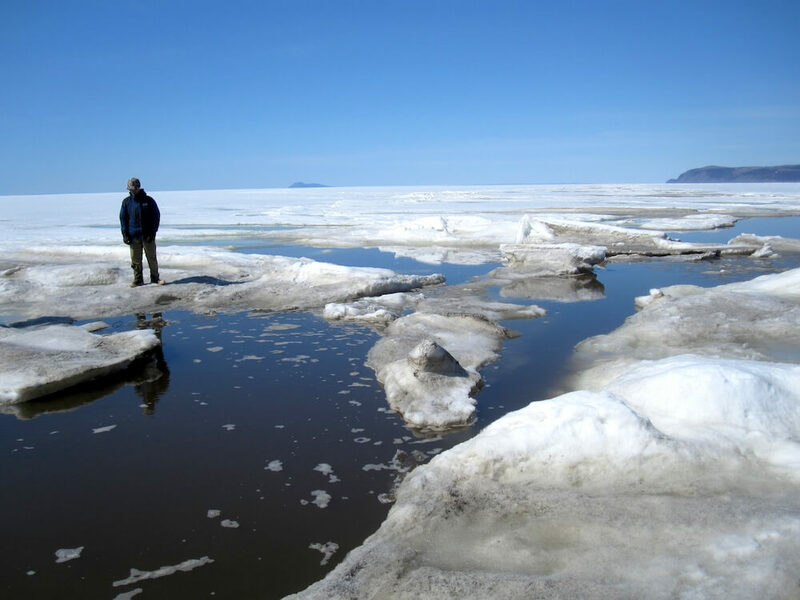 “Permafrost melt is a global event. Industries, like oil and gas have no role in these regions anymore. This is about global climate risk and climate security. Preservation of these marshmires, old-growth forests and tundra habitats, which have been governed for millennia sustainably by the Sámi and other Indigenous peoples, are our best bet for survival as the Arctic warms. They also contain the endemic species of the North, whose preservation has inherent value,” says Mustonen. Dr. Tero Mustonen, a passionate defender of traditional worldview and cosmology of his people, is a Finn and head of the village of Selkie in North Karelia, Finland. He has worked as the traditional knowledge coordinator for Eurasia for the Arctic Biodiversity Assessment. Professionally, he works for the award-winning Snowchange Cooperative, which is a non-profit organization based in Finland with members across the Arctic, including the communities of Eastern Sámi, Chukchi, Yukaghir, Sakha, Evenk, Even, Inuit, Inuvialuit, Gwitchin and many more. Mustonen is well-known scholar of Arctic biodiversity, climate change and indigenous issues, he has won several human rights and environmental awards for the work with Snowchange and indigenous peoples of the Arctic. Hannibal Rhoades is Communications and Advocacy Coordinator at The Gaia Foundation, a UK-based organisation working internationally to support indigenous and local communities to revive their knowledge, livelihoods and healthy ecosystems. Hannibal is a contributing writer at Intercontinental Cry and has covered stories of indigenous and local communities working for environmental and social justice for many publications.